How Many Winters For A Jacket? My winter jacket is green. It’s made of some sort of lightly insulated synthetic material and sewn by someone in China. It’s has one of those fake fur trims around the hood that can be zipped off. I bought it about 3 years ago at Winners for $39.99 (I’m slightly embarrassed that I know this off the top of my head, but I thought it was a pretty good deal at the time, so I guess it stuck with me). Who doesn’t like to indulge a bit? A chocolate bar here, a vacation there, it’s human nature to want to treat ourselves – especially on special occasions. Coincidentally, we just had a few special occasions whip by – Hanukkah, Christmas, Boxing Day, New Years – whatever you celebrate, there was surely an excuse for indulgence in the last couple weeks. For my part, I ate mass quantities of cheese and delicious refined sugar (and no, I don’t really feel that bad about it); I bought some decidedly materialistic (but useful) gifts that I wouldn’t have even considered giving last year; and I definitely burned more than my fair share of fossil fuels, driving up to Pemberton and Whistler to ski, and down to Seattle for a little get away. Big deal, we treated ourselves, right? Well, Christine at Simple Savvy pointed me to this link where you can see people heralding in the new year all over the world. Most of the pictures are of people celebrating -fireworks, facepainting, extravagant celebrations. Take another look that the image above. 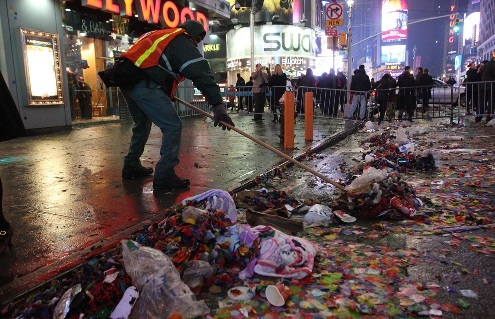 It depicts a sanitation worker cleaning up after New Years in Times Square. It’s beautiful, but I think it’s sadly symbolic of the cumulative impact we have. Maybe each person only had one balloon, or one paper cup, or one handful of confetti, but in the end, it adds up to a lot of garbage. Don’t worry, I’m not getting all doom and gloom on you here. Because the point is that we can also have the opposite effect. If everyone did one thing this year to reduce their consumption or their waste, it might not seem like a big change, but what a huge cumulative difference it would make. Heads up folks. Time to fasten your wallets and cook from the pantry, the annual Buy Nothing Day is here! Hey, if you manage to do it for a day, why not a week. Why not a month? I went to two conferences in the past two weeks, and in the process I learned a lot about social marketing. At the first one, they were using a Mac computer for the presentations, and the first speaker commented about how Mac’s are the best computers and how much they love them. Strangely, every single subsequent speaker, also mentioned their love of Mac products in their talk. At first I thought that they were getting paid for the plug, but then I realized that Mac has developed such consumer loyalty that its clients have become its greatest advertisers – free spokespeople if you will.